“Google makes billions from its cloud platform. Now it’s using those billions to buy up the internet itself — or at least the submarine cables that make up the internet backbone. While past cable builders leveraged cable ownership to sell bandwidth, content providers are building purposefully private cables. The internet is commonly described as a cloud. In reality, it’s a series of wet, fragile tubes, and Google is about to own an alarming number of them. 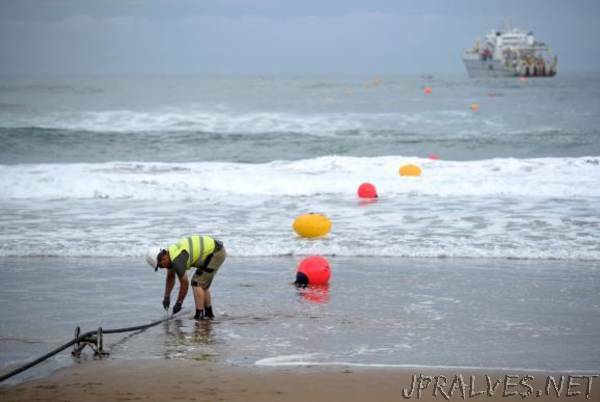 The numbers speak for themselves; Google will own 10,433 miles of submarine cables internationally when the Curie cable is completed later this year. The total shoots up to 63,605 miles when you include cables it owns in consortium with Facebook, Microsoft, and Amazon. Including these part-owned cables, the company has enough submarine infrastructure to wrap around the earth’s equator two-and-a-half times (with thousands of cable miles to spare). This submarine cable boom makes more sense when you look at the growth of traffic that’s taken place in the past decade. In the Atlantic and Pacific, content providers accounted for over half of total demand in 2017. Content provider data use has skyrocketed from less than eight percent to near 40 percent in the past 10 years. It should be noted here that stats are significantly lower in Africa and the Middle East, suggesting that developed nations hunger for video content and cloud apps are a driver of the trend. This is supported by overall international bandwidth use between countries. In 2017, India only used 4,977 Mbps of international bandwidth. The U.S. used a staggering 4,960,388 Mbps that same year. Like the removal of Net Neutrality, privatizing internet infrastructure has only reduced prices for consumers. The problem we now face is a moral one: Do we want a private internet? Or do we want to preserve the “Wild West” web that we’ve had to this point? Unfortunately, the question isn’t as simple as drawing a line between “good” and “bad” network optimizations. Practices like edge networking and zero-rating are critical to the business models of companies like Netflix and AT&T — they also don’t technically violate the rules, and ultimately deliver much better services to consumers.